"The teaching staff are very helpful and if I run into difficulties I can talk to Jo, my student tutor." Former chef Charmaine Simpson will soon have all the ingredients she needs to change career and become a teaching assistant, thanks to Derby College. The mum of two from Shelton Lock is currently studying part-time for the Level 3 Certificate for Teaching Assistants after gaining her level 2 qualification last year. Studying at the Roundhouse marks a return to Derby College for Charmaine who trained as a chef at the former Mackworth campus several years ago. She enjoyed her catering course and was happy to go back to the college when the opportunity arose for her to retrain. Charmaine realised she was interested in working with children when her son was still a baby. She was impressed with how staff at her son’s nursery interacted with the children and thought she’d like a job like that. Although she liked her job as a chef at Severn Trent Water, she wanted to do something which allowed her to spend more time with her young family. 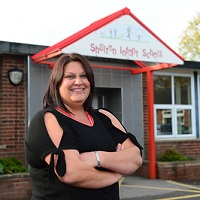 So, she started volunteering in the classroom at Shelton Infants School, where her children attend, which firmed up her decision to become a TA. Charmaine is currently employed as a dinner lady at the school but hopes to get a job as a TA once she has completed her level 3 course. She said: “I decided to go to Derby College partly because other people at school had done their TA course there and also because I’d had a good experience when I did my chef’s course. Find out about studying Teacher Training at Derby College.